33 REASON IN RELIGION (Bashir Ahmad Rafiq) The age in which we are living is also called theAge of reason. With the advancement in science and technology, we are to-day more and more convinced of the application of reason and logic in our dealings with life. Gone is the time when the masses could be compelled to accept a theory or dogma with blind faith. Mankind has laid great sacrifices for the achievement of this end. One of the great results of this type of thinking is that people of the world are also judging the truth of various existing religions through the application of logic and reason. They do not and would not put their faith in anything which they are unable to understand. Only that religion would fairly be considered as the religion of the masses which could stand this challenge. Let us, therefore, judge two great faiths by this standard. Christianity is considered to be the religion with the largest number of followers in the world. Its teachings certainly do not allow the use of reason in matters of the dogmas of faith. As far as the real Jesus is concerned, we definitely think that they were based on common sense and logic. Immediately after his disappearance from the scene, Paul changed the whole face of Christianity. Paul was not a disciple of Jesus in the sense that he never met him during his life time. He was a Jew with a background of Roman education. He had a superiority over the other disciples of Jesus by being granted Roman citizenship. With such ‘a back-ground, he naturally thought himself to be the most competent in understanding the Divine Call, although the true knowledge of God and the understanding of His message does not require a person of any worldly degrees or scholarships. God Himself teaches and educates those whom He wants to raise for the reformation of the world. Peter, though an illiterate and a poor fisherman was, in the sight of God, far more educated and literate than any other of his contemporaries who had worldly degrees. He was taught and trained by the Master (Jesus) himself and therefore his integrity and scholarship was far more than Paul’s. It was because of this understanding of the truth that he opposed Paul on many occasions. He opposed him on the question of the 34 REVIEW OF RELIGIONS preaching of the new faith to the Gentiles. Paul, however, introduced such ideas into Christianity that proved fatal to the progress of the true religion of Jesus. Paul invented the theory of original sin. This theory has never been understood by any reasonable human being. Trinity was introduced, making again a stumbling block in the way of reason. The Resurrection and Ascension are other such irrational theories. Judged by any yard-stick, Christianity is based on mythology and superstition. Trinity was considered to be the principal pillar of Christian teachings. The deniers of Trinity were branded as heretics and sinners. Many of them were excommunicated because they believed in the unity. But in this age of reason, a rational being, could not be satisfied with the ridiculous trio. How could there be three Almighties is a question often asked by the people. There is no explanation to it, except that it was a mystery that was never understood by anyone, and yet we are bound to have faith in it. When the thinking Christians found no escape and could not explain the fundamen- tals of Trinity, they commenced denying it openly. The religious sect of Jehova’s Witnesses belong to this class, they deny Trinity but believe in the duality of God. They bring the position of Jesus slightly down, but have the same ideas of original sin, worship of Jesus, etc. The swing towards the Jehova’s Witnesses from orthodox Christianity is not because they find an escape in it from the irrational dogmas of the orthodox Christians. But the question is, will the masses find satisfaction in the Jehova’s Witnesses’ interpretations – certainly not, because they will also find in it the same trend of blind faith with regards to other vital questions i.e. The Ressurection, The Ascension, etc. 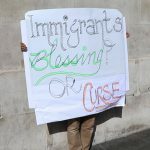 Thomas Paine was among the-first of the thinkers who raised their voices doubting the credibility, absurdities and irrational teachings of Christianity. He was persecuted for his views; how truly he said: In my publications on religious subjects, my endeavours have been directed to bringing man to a right use of reason God has given him; to impress upon him the great principles of divine morality; justice, mercy and a benevolent disposition to all men and to all creatures and to inspire in him a spirit of trust. The result of Thomas Paine’s thinking and reasoning of the question of God was in his own words: I believe in one God, and no more and I hope for happiness beyond this life. REVIEW OF RELIGIONS 35 Every correct thinking person is bound to accept the unity of God and to reject the ridiculous dogmas of multiple divinity. Now let us consider the case of Islam in this respect. The Holy Quran is the Muslim scripture. It contains a complete code of conduct for Muslims in it. The main characteristic of the Holy Quran is that it bases its arguments and claims on reason and logic. For every article of faith there is a reasonable explanation. 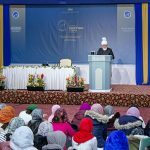 In the Holy Quran, Allah lays down the following principle for mankind to follow: Thus does Allah make His commandments clear to you that you may understand. (2:243) According to this verse all the commandments of Allah are clear to understand. There is no ambiguity or crookedness in them. They are based on reason and understanding. Apart from this there are many other verses where Allah has mentioned the application of reasoning in support of Islam and its teachings. Now let us examine only three of the main teachings of Islam, on this standard. The most pertinent question in all faiths is the conception of God. What is God and what relationship have we with Him? What are, His powers? As mentioned earlier, Christianity gives a very ambiguous and ridiculous explanation of God that could never be understood by anyone in the world. Recent sttempts to explain Christian teachings on God have deteriorated the position of Christianity. This question of the Trinity was also discussed at length in the famous council of Nicea in 325 A.D. when by a majority vote, the idea of Trinity was adopted. It was never preached by Jesus or his disciples. Jesus was a pure Unitarian Jew. Islam is very clear on this subject. The Holy Quran supports its claims with strong arguments. It declares: And your God is one God, there is no God but He, the Gracious and Merciful (2:164) The next verse after this furnishes proof of the existence of God: Verily in the creation of the heavens and the earth and in the alteration of night and day and in the ships which sail in the sea with that which profits men, and in the waters which Allah sends down from the sky and quickens therein the earth after its death and 36 REVIEW OF RELIGIONS scatters therein all kinds of beasts, and in the change of the winds, and the clouds pressed into service between heaven and the earth, are indeed signs for the people who understand, (2:165) This verse supplies an argument in support of the existence of God referred to in the preceeding verse. A careful study of the universe definitely points to a Creator. Heaven and earth, night and day, the supply of provisions, rainfall with its power of quickening and devestating, the means of communications, the blowing of the winds, the sunshine, all point to one controlling agency, i.e; the God, the maker of heavens and earth. Once an illiterate Arab was asked by his scholarly friend the proof of the existence of God. The Arab said that whenever he sees on the sands in the desert some droppings of the camels he becomes certain that some camels have passed through there. If just by such droppings one could be sure of the existence of a camel why one should not be sure of the existence of God who has created all the worlds and all the objects, in it. Thus the Holy Quran declares that there is a God who is One and then in the next verse furnishes the argument in its favour. The next point is whether we could communicate with God. Does He hear us and could He answer our supplications? On this question again Christianity does not offer any reasonable answer. The denial of revelation is very common among Christians. Christendom has failed for a long time to provide any example of persons with revelational experience. According to the Quran, however, God has spoken to men in all ages and still speaks to His chosen ones. 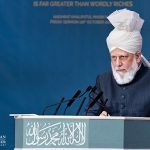 In the present age we have the Promised Messiah, the Founder of the Ahmadiyya Movement who declared that God spoke to him and revealed the future news to him. God says, in the Holy Quran: And when My servants ask thee about Me, say: I am near. 1 answer the prayers of the supplicant when he prays to Me. So they should harken to Me and believe in Me, that they may follow the right way. (2:187) This verse furnishes the answer to the question: Does God communic- ate with us? The answer is in the affirmative. God is near. He not only hears our prayers but also answers them. 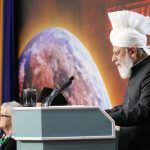 The Ahmadiyya Movement by the Grace of God, has produced thousands of people who declare and prove their claim that God speaks to REVIEW OF RELIGIONS 37 them and answer their prayers. When the Christian crusader, Billy Graham toured Africa, our missionaries there threw out a challenge to him. It was suggested by our missionaries that if he could not take part in a debate on Trinity with the Muslims, he should come forward and choose 30 incurable patients from the hospitals, divide them among his group and the Muslims, then both the groups will with humility and sincerity pray for forty days for the recovery of the patients. If most of the patients of the Muslim group were cured, it would be a proof that the same was a religion from God. He never accepted this challenge, but continuously avoided the issue and the Ahmadiyya missionaries. The challenge still stands! Thus every aspect of the conception of God is so clear according to Islam, that it could be understood by all. The same is the case with all other fundamental teachings of Islam. They are based on a philosophy to be understood by all human beings. One point here needs clarification and that is the place of reason in religion. As mentioned previously, Islam encourages the use of reason in the understanding of the fundamental teachings. But it also makes it quite clear that reason alone could not be the sole judge of the establishment of the relationship with God. Mere reason could take us to a certain degree of understanding, but when it is coupled with the divine revelation, it brings certainty to our mind. Thus the straight path is the use of such reason which is also coupled with Divine light. The following example will make this point clear. By mere reason we could only attain a stage where we could realise that there should be the Maker of the world, i.e; a God. But the revelation and the Divine light takes us a step forward by saying that there is a God. The difference of should and is is quite clear. We arrive at the truth by reasoning, but the certainty in faith is obtained only when reason is coupled with Divine light. According to Islam, both are equally important; one is bound up with the other. Mere reasoning would lead us to agnosticism. It could not be a real guide to God or the Maker. But to be certain of the existence of God, we do need Divine revelation. 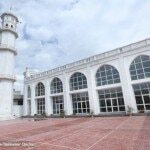 In the present age we have been blessed with the advent of the Promised Messiah-HazratMirza Ghulam Ahmad of Qadian, who has proved to the world that God speaks and reveals Himself even today.